Old age is not a disease. Improved nutrition and exercise, as well as advances in veterinary medicine, result in longer and healthier lives for our pets. Although your pet’s health as he ages is not entirely in your control, you play a critical role in keeping him active and comfortable. Being aware of the natural changes that can occur will ensure that you both enjoy this stage in his or her life. The first sign of aging that you will notice is often a general decrease in activity, combined with a tendency to sleep longer and more soundly. Just as in humans, the aging process varies with each individual. 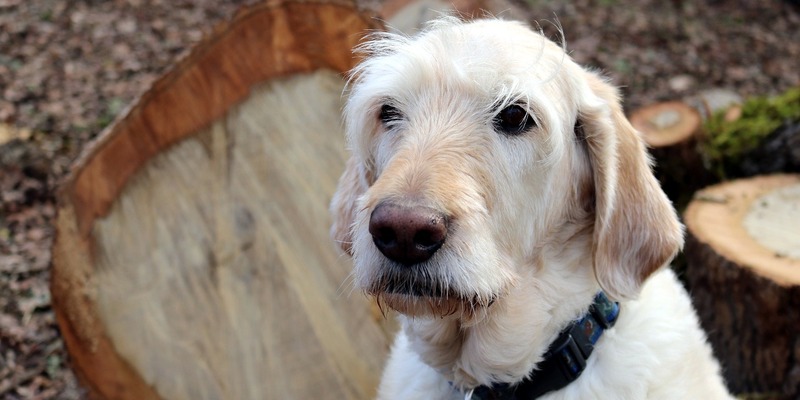 When you first see those gray hairs on your dogs’s muzzle, don’t be upset – he isn’t! He doesn’t know he’s getting older. He isn’t concerned about the gray hairs or other physical changes – such as not being as active or limber as he once was. He doesn’t really fret over his decreasing eyesight, hearing, and smelling. He doesn’t stress about sleeping all day – he just takes it one day at a time. Again, these numbers vary; the aging process varies with each individual pet. That’s why a baseline assessment is so important. What does the ‘Senior Wellness Exam’ consist of? – thyroid panel to check for proper functioning of thyroid. As in humans, the best way your vet can interpret any and all exams and tests is by comparing them with previous ones. Which is why establishing a baseline as early as possible is important. The baseline is the first assessment and provides the standards against which all subsequent tests will be measured. Early detection increases likelihood that any problems can be treated, and in the long run is far less expensive. REPEAT – far less expensive. – How much food is he eating? Does he leave hard food and eat only soft? Any difficulty eating or swallowing? Any vomiting? – Water consumption: more or less than usual? – Output: more or less? Urine and poop: color, consistency, frequency. Any pain? Incontinence? – Groom regularly: check for lumps, bumps, sores. Hair loss? Abnormal odors? – Behavior: sleep patterns, obeying, incontinence, behavior around people, anxious when left alone? – Activity and mobility: stairs, does exercise cause unusual exhaustion? Bumping into things, collapsing? Balance? Change in gait? – Respiration: coughing, panting, sneezing? – Dental care: drooling, sores, bad breath, swollen gums, gum color: yellow, light pink, or purplish? – Is your dog unusually hot or cold? Be aware of any and all conditions and changes. The more you can tell your vet, the better – remember – you are your pets’ communicator. The vet can’t treat what he doesn’t know. Finally, the following points will help you and your pet enjoy this chapter of your lives. 1. Nutritional needs change as your pet ages. Although this is the most common problem in aging pets, it is the easiest to control. Your pet’s weight is entirely up to you. Discuss with your vet how to manage your pet’s weight, then stick to it. Obesity puts pressure on joints and internal organs. Not only will too much weight reduce your pet’s lifespan, it will also make his remaining years possibly painful and expensive. 2. Exercise keeps your pet happier, both physically and mentally. As he ages, you must increase the frequency and decrease the intensity of physical exertion. Again, you are in control. Dogs, especially, will overdo it if you let them. So pay attention and maintain consistent, low intensity recreation. 3. Dental care is always critical, but especially so in older dogs. Bad teeth and mouth can make eating painful as well as spread bacteria throughout the body to vital organs. Prevention is key. It is never too late to start brushing your dog’s teeth. Start at the vet and get a professional assessment of his mouth and teeth. The vet may or may not want to do dentistry which involves anesthesia. Risks of anesthesia have decreased greatly in recent years. Still, it is a conversation you must have with your vet. 4. As dogs and cats lose hearing and sight, they do just fine. Again, it is up to you to keep their world safe. And consistent (don’t move the furniture!). 5. Incontinence is almost inevitable. The first thing to do when Fido starts having accidents is rule out any health problem. There could be infection, loss of muscle tone, or other treatable causes. If not, it is manageable. Think towels, washable rugs for bedding, or diapers when you must be away for extended lengths of time. 6. Benign fatty tumors are common and usually nothing to worry about. Pay attention to change (again, the baseline) and be prepared to discuss in detail with your vet to evaluate. Your pet will love when you check him regularly for lumps and bumps!